Hot off the press (or should that be out of the oven?) are this year’s Michelin Guide star ratings. If you’re in search of a fancy-pants dinner (er, always), don’t book anything until you’ve had a peek at our round-up, showing which restaurants in Wiltshire, Gloucestershire and surrounding counties have (1 Michelin) stars in their eyes. 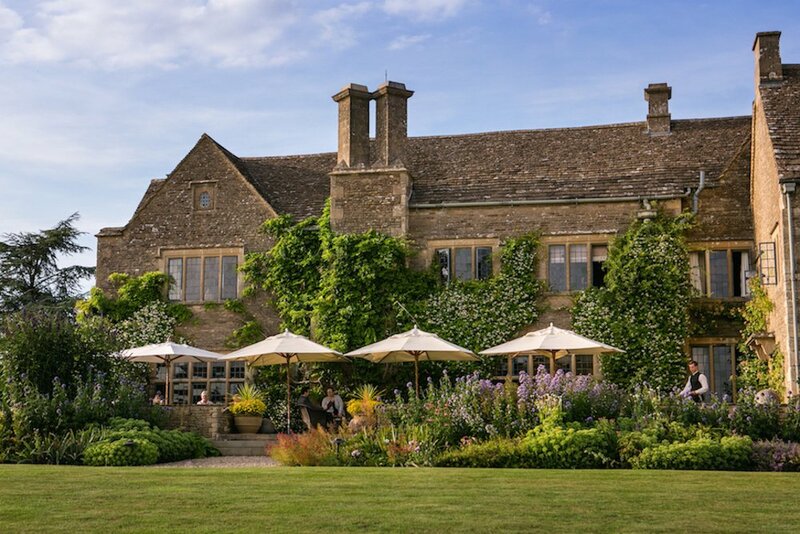 The Manor House is a five-star luxury country house hotel in the Cotswolds with Rob Potter, previously at Michelin starred Lucknam Park, in charge of The Bybrook restaurant since 2016. Walk off a gourmet lunch in the glorious grounds or picture postcard village – or maybe make a weekend of it? Michelin’s Young European Chef of the Year 2018, Niall Keating, takes his inspiration from around the world including Korean, Japanese and French cuisine. £200 will get you the gastronomic tasting menu with matching wine. Stupendous 5-star country house hotel (it’s got a mile-long driveway) with a very posh dining room – no ripped jeans or trainers allowed in here – headed up by Hywel Jones. Michelin starred since 2006. Another pub, another county. This time it’s a thatched country pub run by two chefs, just 15 mins drive from Stonehenge. Prix Fixe Weds–Fri lunch/Thurs & Fri dinner is especially good value. Down from 2 to 1 star this year, chef David Everitt-Matthias and front of house wife Helen have been running this place since 1987 – and David’s never missed a service, apparently. The decor may not be exceptional but the French food is. In the basement of the elegant, eclectically styled Queensberry Hotel, the winner of Bath’s one and only Michelin star, Chris Cleghorn cooks up Modern British in the Olive Tree restaurant. Thoughtful as well as talented, no one’s left out: amongst his ‘fives’ and ‘sevens’ multi-course tasting menus there are vegetarian, vegan and dairy-free ‘sevens’ too. No fancy surroundings – this is a homely Somerset boozer run by brother and sister duo Josh and Holly Eggelton – but the food’s been Michelin star standard since 2011. Just your average neighbourhood restaurant. Not. Sit downstairs near the kitchen where chef/proprietor George prepares seasonal organic and foraged menus, often using pickled and preserved ingredients. Put me down for the nine-course tasting menu on Fridays and Saturday eves. This tiny family-run restaurant with just nine tables is housed on the ground floor of an old hospital along Bristol’s waterfront. Chef Peter Sanchez-Iglesias and his team serve up just one eclectic multi-course tasting menu and advise allowing around three and a half hours to enjoy it to the full – alrighty! Owner James ‘Wilks’ Wilkins learned his craft under Gordon Ramsey, the Galvin brothers and triple Michelin starred Michel Bras in France and Japan before setting up on his own. It took just a year to be awarded a Michelin star in 2012. Expect classic flavours, traditional and modern techniques – and an exceptional Sunday roast. They lost their 2 star status with the departure of Michael Wignall but new Executive Chef, Chris Simpson’s decadent tasting and à la carte menus wins him his first 1 star. Nosh in a wood-panelled restaurant set within a luxury mock Tudor mansion overlooking the river Teign. With over 13,000 bottles in the wine cellar there’s sure to be something to tickle your fancy. Hurrah for the recognition of Michael Caines’ super-classy destination in south-east Devon. If you’re curious, try and nab yourself tickets for a dining event with the chef himself at the end of this month. Oh we do like to be beside the seaside. Especially if we’re tucking into food that’s as amazing to look at as it is to eat. This super relaxed (well-behaved kids and dogs both welcome) bistro overlooking Torquay harbour is run by one of the UK’s most decorated chefs Simon Hulstone and his wife Katy. These guys arrived on Exmoor’s food scene in 2005, won their Michelin star in 2006 and have retained it ever since. I’m no expert, but I reckon owner and chef Mark Dodson knows what he’s doing. Unpretentious surroundings (underneath a B&B) and super-fresh seafood caught that day, cooked up by Thomas Carr, who trained under Cornwall’s Nathan Outlaw.